Hannah is six years old; her brother Jack is four. And they’d like you to know that it’s been a while since they last reviewed a book. 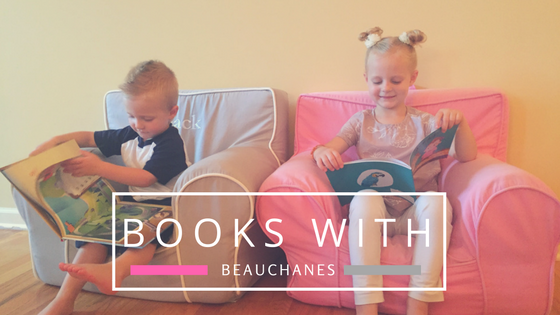 The Beauchane children love a good book, even one beyond their reading level. Hannah has begun reading on her own and constantly challenges herself to complete any type of book. However, she made it very clear that she is not a fan of chapter books. The Misadventures of Michael McMichaels is a series based around a third grader with an active imagination. In the latest addition to the series, Volume 4, The Double-Dog Dare, a new student named Zeke comes from a wealthy family and threatens to steal Michael’s best friend, Kenny, because of said wealth. This sparks a heated argument between Michael and Zeke, ultimately ending with a dare contest. First, Zeke dared Michael to jump onto a table at Kenny’s birthday party and cluck like a chicken. Easy enough! But as retaliation, Michael brings out the double-dog dare and told Zeke he has to repeat everything their classmate Harriet says for an entire day. Michael’s plan is foiled, as he didn’t specify that Zeke had to repeat everything loud enough for the whole classroom to hear him. As their double-dog dares get worse, they start to bend the rule of not requesting a dare that would hurt someone’s feelings. Feelings are ultimately hurt, and both of them learn valuable lessons when it comes to respect, open-mindedness and the value of true friendships. Respect is a major lesson that Hannah and Jack caught onto early on. They thought it was silly that Michael and Zeke couldn’t share Kenny as their friend and didn’t like that their dares became mean. When they became disrespectful to their classmates Harriet and Absimil, they lost a bit of interest in the storyline as it wasn’t something they’ve experienced before. There were quite a few concepts and phrases that were sprinkled throughout the book that had Hannah and Jack stop to ask questions. Words like “refugee” or “betrothed” or the concept of freedom in America were all topics beyond comprehension. While all great lessons, they are lessons that should be discussed at a much higher reading level - as this book is intended for grades first through fifth, it will be interesting to revisit when they’re at that level. It’s safe to say, while they laughed and asked tons of questions, The Misadventures of Michael McMichaels: Vol. 4, The Double-Dog Dare will be one of their books that sits on the shelf until they’re a bit older.